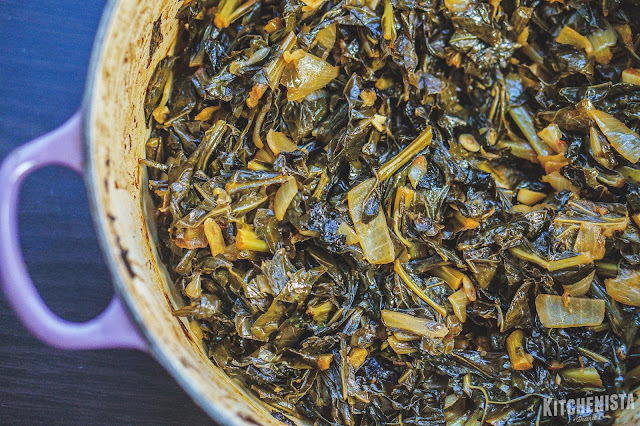 A couple weeks ago, I showed you how to make a traditional pot of southern collard greens. Today, I'm going to give you the cheat code. These aren't the slow cooked, pork-infused greens with pot liquor that we grew up on. 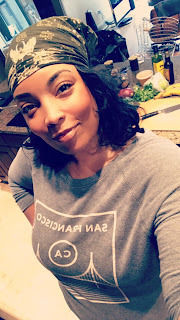 But they'll convert anybody who thinks collard greens need to cook all day with meat to be good. This is a simple recipe. The magic really comes from the greens cooking in a covered Dutch oven pot in the oven. They essentially braise in their own juices, resulting in silky tender greens and bits of sweet roasted garlic that melt in your mouth. If you've ever sauteed collard greens and been a bit disappointed by the texture, this method will change your life. Even the stems get tender, so go ahead and use the pre-chopped bags from the store to truly make it an easy side dish. 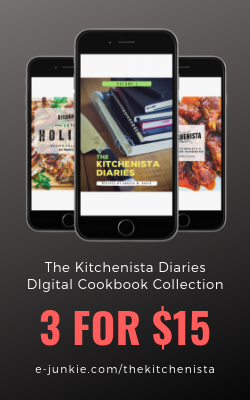 It's an especially great option for vegetarians, vegans and Whole 30 or paleo dieters. 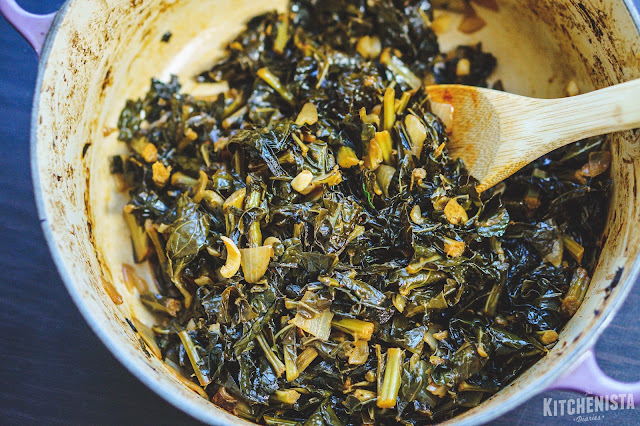 If you're a fan of mixing your greens, Tuscan (Lacinato) kale has a very similar texture to collard greens when cooked, so it makes a perfect addition to the pot. Over medium heat, add 2 tablespoons of olive oil to the pot. Add the sliced onions and cook for a couple minutes just until onions are softened, seasoning with salt and pepper. Stir in the chopped garlic, pepper flakes, smoked paprika and vinegar. Cook for another minute until fragrant. Add the greens, stirring so they wilt down a bit and to evenly distribute the onions. Season generously with salt and pepper. Drizzle olive oil over the top of the greens. Cover the pot and transfer to the oven. Roast for one hour. After roasting, stir in the lemon and butter, if using. AMAZING! Now I cook all of my greens like this. Thank you Angela! Once I found this recipe, it changed the way I do greens. I change the spices a bit, depending on mood, but this method of toasting them in a Dutch Oven is now my standard operating procedure. Steam ovens are consequently equipped for accomplishing most extreme productivity being used since the component just warms the volume of water adequate for the cooking procedure. Very good and quite easy. Great flavor with my fresh broccoli greens.